Step 1) First download and install WinPcap (WinPcap in Windows is used for capturing network traffic. )You can use Pcap in libPcap library for unix like systems. 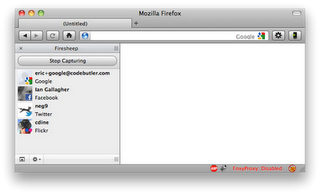 Step 2) Download and open Firesheep in Firefox, it will automatically install it. Or just drag it and place it over Firefox shortcut (Firesheep at this instant is not supporting Firefox 4 ). details with photos of the target. Click on one of it and you will directly enter in his account. Simple as that.